1.14.19 beta working ok now on Win 8.1 system; Float window pull down list of temperatures is now readable. CPU and hard disk temps are shown, however temp of graphics adapter is not shown. On Win 7 x64 laptop CPU, hrad disk and graphic adapter temps are visible. Something to do with Win 8.1? It would be nice if the pull down list data of the float window would be dynamic i.s.o. static. Float window main figures are dynamic.However when you click on for example CPU, pull down list data of CPU activity opens but these figures are a snapshot and are not dynamic. Only the CPU temp graph is dynamic. The static behaviour of the pull down list data also applies for the other float window main figures. You will do get a new snapshot when you hoover the mouse pointer left or right or click again on the main figure in the float window. But may be this improvement would consume too much memory; this program should be kept as small as possible.if it runs in the background. We'd like to help you with the issue. The following screenshot is the full temperature showing on Wise System Monitor. 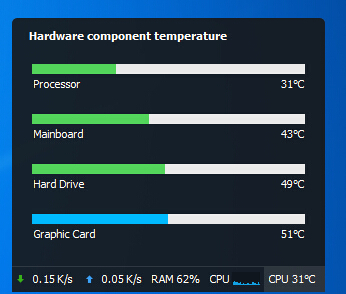 Processor, mainboard, hard drive and graphic card are main components in a computer, since these components are made by different manufactories, the temperature showing are different rather than related to the OS. And some of the components can’t be shown due to this reason. By the way, thanks for you suggestions you mentioned! I just love the simplicity (and power) of this little gem. The one feature this program lacks is to be able to attach it to the taskbar as a deskband or taskbar toolbar. I would also like these values to update. Just as an example, I would be able to quickly determine if an application is stealing bandwidth if these values continue to update. As it is now, WSM could take a snapshot at a moment when an application stealing bandwidth actually shows low bandwidth usage and the very next second it will be high again, but because of the static snapshot I will never know this.